Four years ago right now, I was getting married in Asheville, N.C., surrounded by friends and family and standing in front of a beautiful bride. It was, and still is, one of the very best days of my life. And this is the first time since then that I've encountered a New Year's Eve - and an anniversary - when I wasn't married. For myriad reasons, it didn't work out. That comes with tremendous, life-changing amounts of disappointment. It challenges you in ways you've never been challenged, threatening to take you to dark places you've never before seen. Also considering two job losses in the past 18 months, disappointment has most certainly been a theme for me in 2017. Maybe that defined your 2017, too. But hope has also been a recurring theme of the year, reminding me that it's present no matter what you go through. There's always been something or someone there to pick me back up, even if some days they aren't as obvious as others. Thank God for hope. To update where the project stands: We continue to move down the track toward creating a documentary series about Austin Peay's miraculous, incredible 2017 season: The Governors were mired in a 29-game losing streak in September - having lost 46 of their previous 47 games - and they closed the year 8-1 vs. FCS opponents. They tied the school record for wins in a season, setting a new school record for conference wins in a year. Second-year coach Will Healy won the Eddie Robinson FCS National Coach of the Year award, an honor he'll receive at a banquet next week in Dallas. Our cameras tracked this remarkable 180, the highs and lows of a truly unique season and situation. I didn't know what the team would do when we started recording, but I believed something special was coming. I was convinced of it enough to act on it. After the eighth and final win, I was in the locker room when Healy assured the team that it had earned a playoff spot. I was in the weight room an hour later when Healy broke down and cried, fearing that he'd built the players' hopes to an unreasonable level. "These kids believe me that we're in the NCAA playoffs," he told me (and the camera). "What if we aren't?" As it turned out, his concerns were justified. 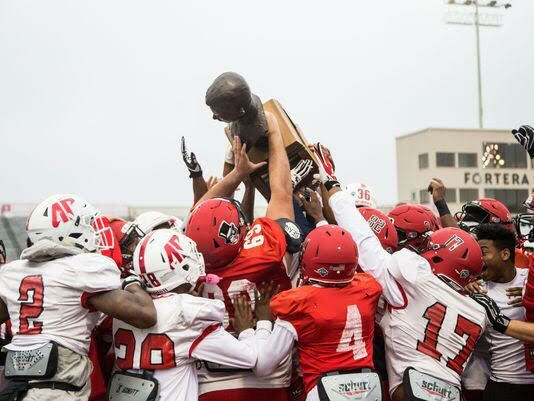 The next morning, Austin Peay learned that it was literally the first team left out of the 24-team FCS playoff field. The air came out of the room when the ESPN host said, "That's it. That's the field." A silence fell over those gathered in the stadium's club level. What happened next is something I'll never forget. Doing his best to set aside his own devastation, Healy addressed the team - and particularly its seniors - for several minutes. He reminded the players, and those seniors, what they had done to change an entire football program. He reminded them that they were now equipped for success in life, as husbands and fathers and professionals. He reminded the seniors that, literally, they'd go out winners. Out of profound disappointment came an overwhelming sense of hope. That was my 2017. It's the foundation on which my 2018 will be built. Happy New Year, everyone. Cannot wait for you to see this documentary series.